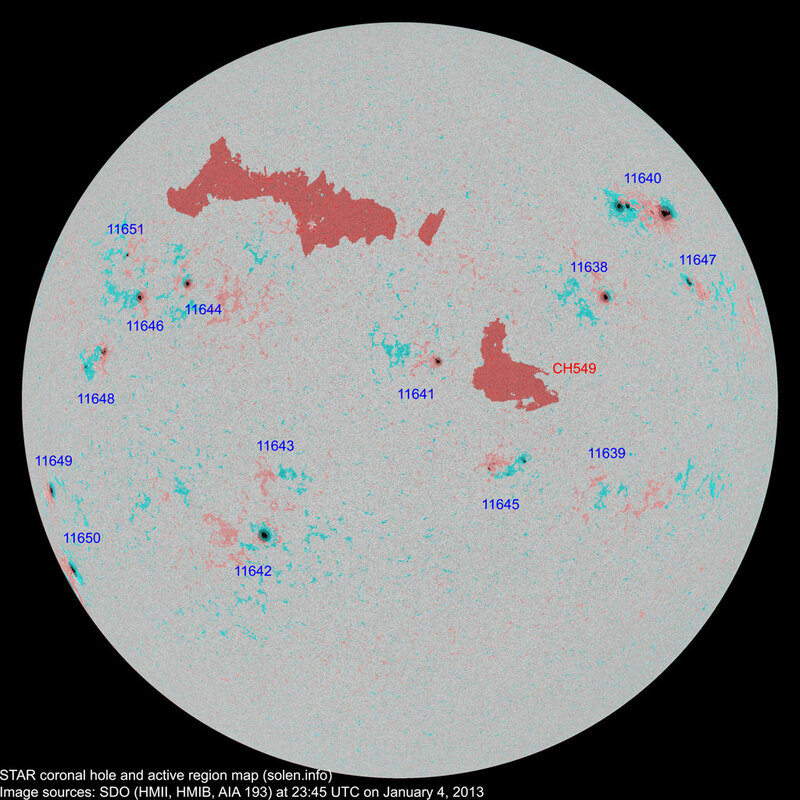 Last major update issued on January 5, 2013 at 05:10 UTC. 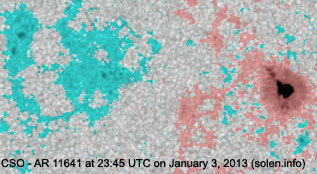 The geomagnetic field was very quiet on January 4. 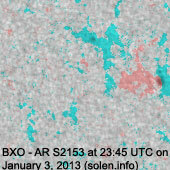 Solar wind speed at SOHO ranged between 278 and 370 km/s. 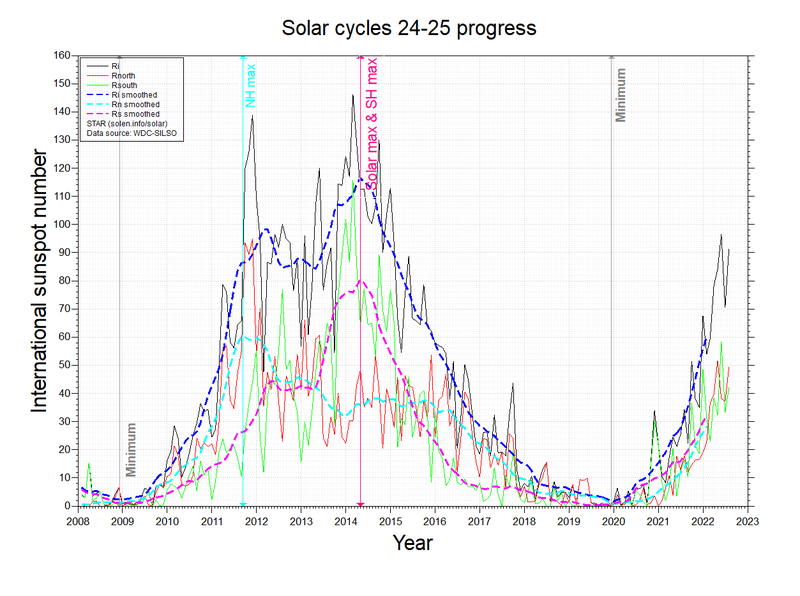 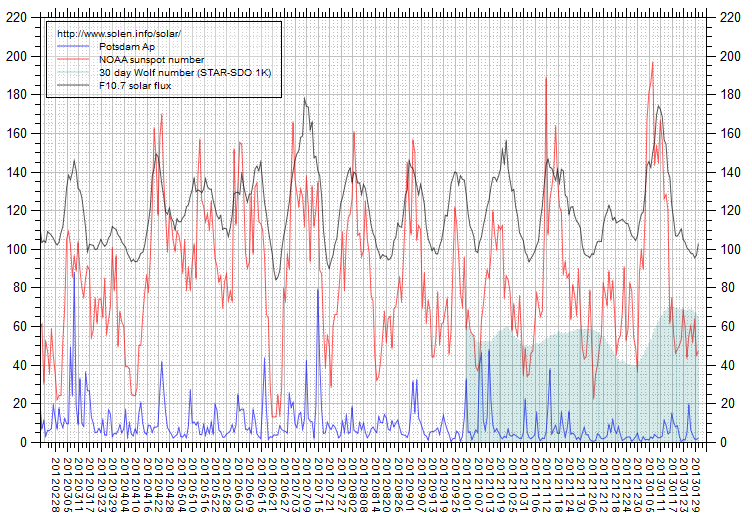 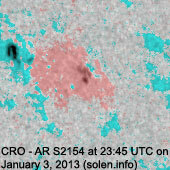 Solar flux measured at 20h UTC on 2.8 GHz was 143.1 (increasing 42.0 over the last solar rotation). 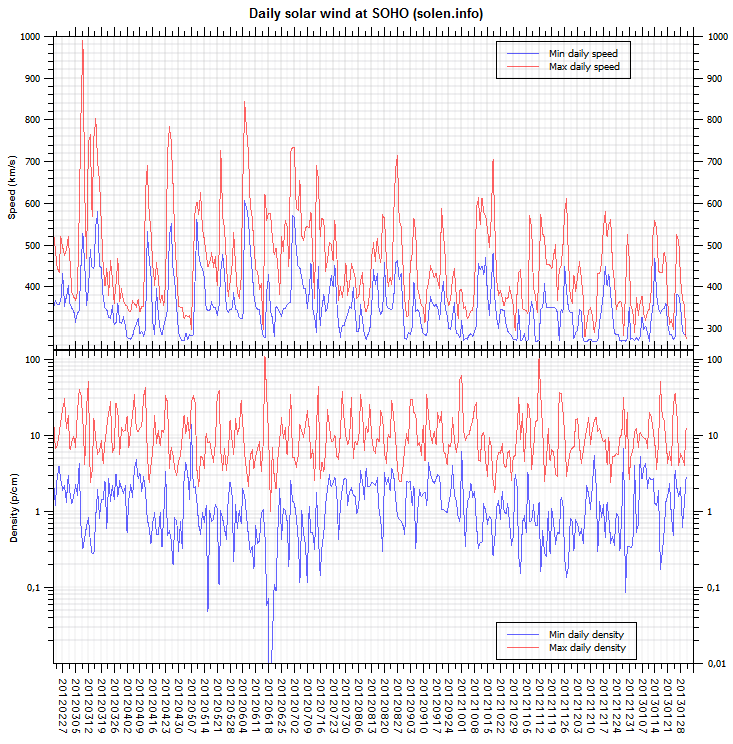 The Potsdam WDC planetary A index was 1 (STAR Ap - based on the mean of three hour interval ap indices: 1.1). 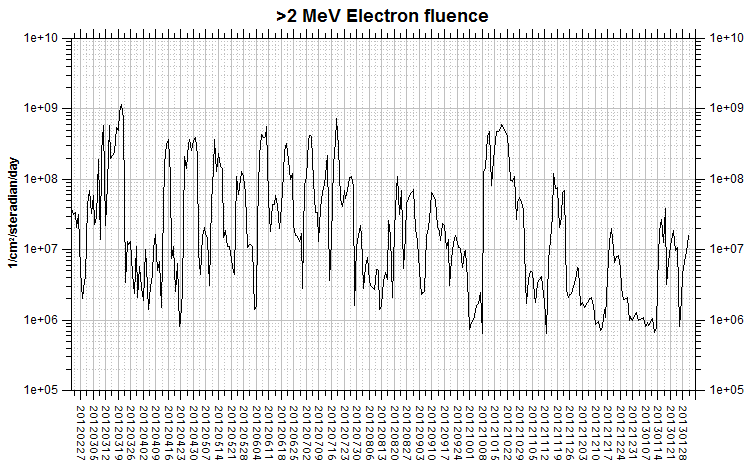 Three hour interval K indices: 10000000 (planetary), 00000211 (Boulder). Region 11638 [N13W33] decayed slowly and quietly. 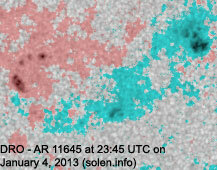 Region 11639 [S17W33] remeerged with tiny spots. 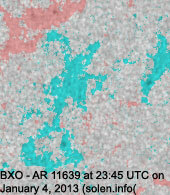 Region 11640 [N28W48] lost approximately half of its spots while the main penumbrae increased their area. 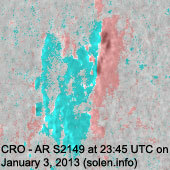 The region has a fairly simple magnetic layout. 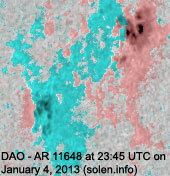 Region 11641 [N03W05] was quiet and stable. 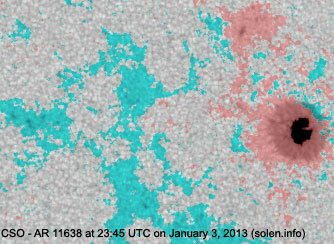 Region 11642 [S24E23] was quiet and stable. 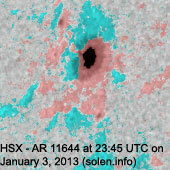 Region 11643 [S14E18] was quiet and stable. 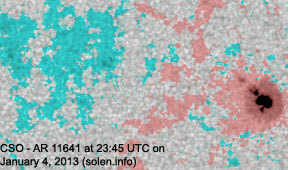 Region 11644 [N15E36] was quiet and stable. 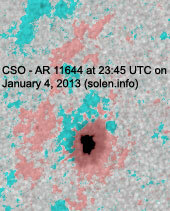 Region 11645 [S13W17] decayed slowly and quietly. 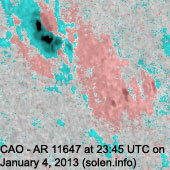 Region 11646 [N13E45] was quiet and stable. 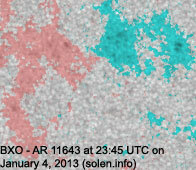 New region 11647 [N16W53] emerged on January 2 and got its NOAA number 2 days later. 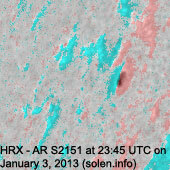 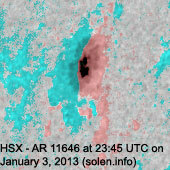 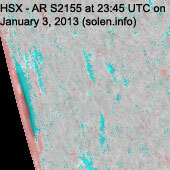 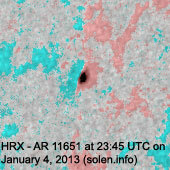 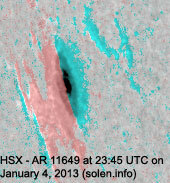 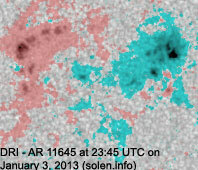 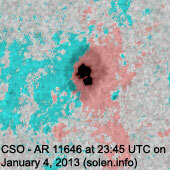 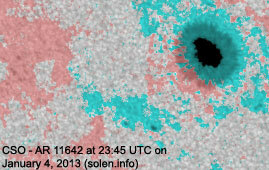 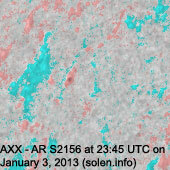 New region 11648 [N04E53] rotated into view on January 2 and developed on Jan.4 when it was numbered by SWPC. 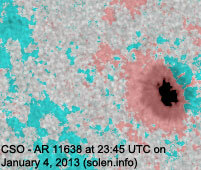 New region 11649 [S14E71] rotated into view on January 3. 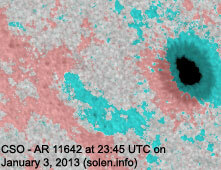 New region 11650 [S27E76] rotated partly into view. 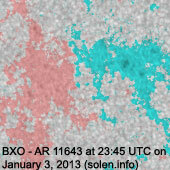 New region 11651 [N20E50] rotated into view onn January 2 and was numbered by SWPC 2 days later. 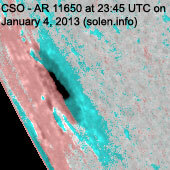 An interesting region is just behind the northeast limb and will likely rotate into view today. 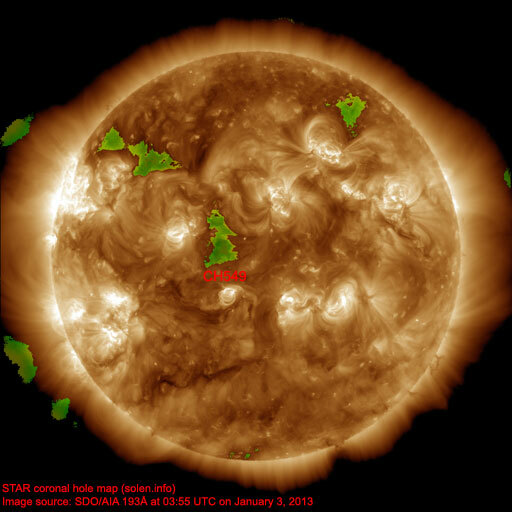 The geomagnetic field is expected to be quiet on January 5-6. 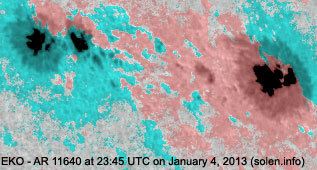 Quiet to unsettled conditions are possible on January 7 due to weak effects from CH549.